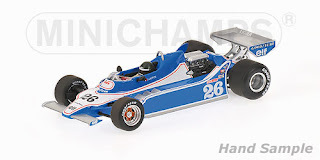 Due in stock next week is the final Ligier JS11 F1 car by Minichamps. This will be the version as driven by Jacques Laffite to victory in the 1979 Brazilian Grand Prix. Also due next week is Jenson Button's 2011 McLaren F1 Showcar by Minichamps and Stoner and Hayden's 2010 Ducati Moto GP Bikes in 1:12 scale. For details on these models plus 1000's more please visit our store below. 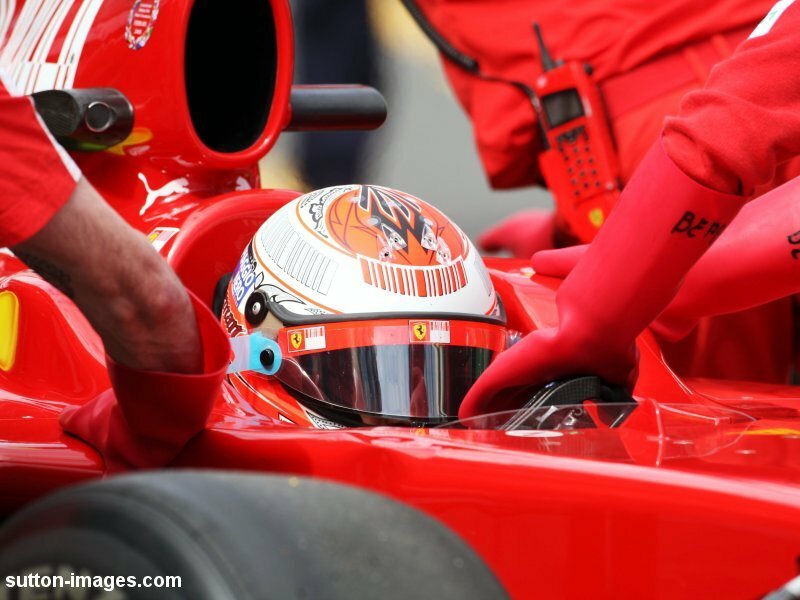 It's great news to hear that Kimi Raikkonen has signed for the Lotus Renault F1 team for the next two seasons. We are already looking forward to receiving next years Die-cast replicas as Raikkonen has always been one of our top sellers. Plus F1 should be even better next year with six World Champions lining up on the 2012 F1 grid. 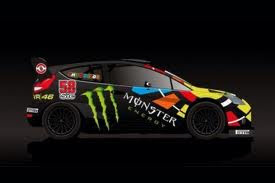 We are hoping that Minichamps release a die-cast replica of this Ford Fiesta WRC Rally Car that Valentino Rossi drove to 2nd place in this weekends Monza Rally, great artwork on the car. 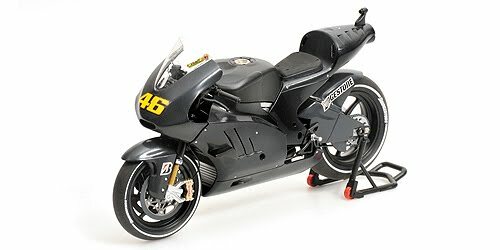 Now in stock is this stunning 1:12 scale Valentino Rossi Figure from the 2009 Estoril Moto GP Race. As with all Minichamps models the detail is second to none and the paintwork in the helmet is amazing. Limited to just 2,999 models Worldwide this is sure to be highly sought after in years to come. The model is in stock now at £52.99, please see our store below for details. Due in stock next week is the latest Valentino Rossi Minichamps Model. This stunning Ducati 2011 Test Bike will be limited to just 4,999 models Worldwide so is sure to be as popular as all the previous Rossi models that have sold out. Visit our store below for full details next week. 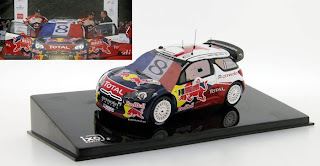 IXO Models have just confirmed that they will be producing two special edition Citroen DS3 WRC Rally Cars to celebrate Sebastien Loeb's 8th WRC Drivers Title. 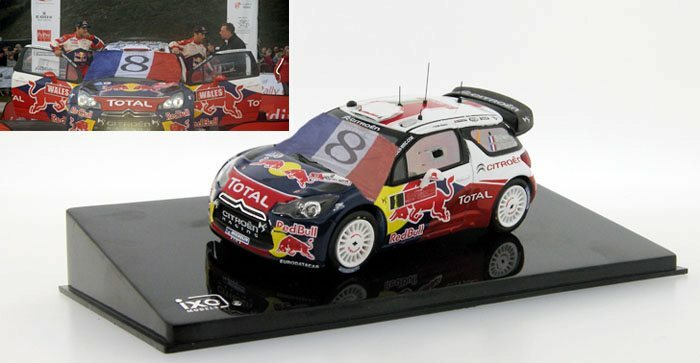 The one pictured will have the French flag over the windscreen and the second model will have a dirt effect paint job from the 2011 Wales GB Rally. For prices and pre ordering please visit our store below. Both models are due next Month.